The southern chinch bug, Blissus insularis, is a difficult-to-control and damaging insect pest of St. Augustinegrass in Florida. Nymphs and adults feed on plant fluids within leaf sheaths, down in the thatch, and this feeding kills the grass plants and contributes to weed invasion. Southern chinch bug activity occurs from March through November in north-central Florida and is year-round in southern Florida. It is estimated that 3 to 4 generations with overlapping life stages develop each year in northern Florida and 7 to 10 generations develop in southern Florida. One generation may last 6-8 weeks in hot temperatures. Several insects live that can be confused with chinch bugs in St. Augustinegrass lawns, so proper insect identification is important. 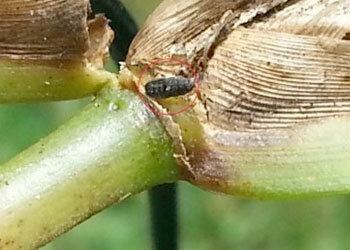 Adult southern chinch bugs are about 1/8 to 1/10 of an inch long. The wings are folded flat on the back and are shiny white with a triangular-shaped black marking in the middle of the outer edge of each wing. Adults may have long or short wings, and populations often contain both. Their bodies are black. Adult females may live up to 2 months, laying 4 or 5 eggs a day or 250-300 eggs in a lifetime. Newly hatched nymphs appear orange red with a pale whitish band across their abdomens. As they molt through five growth stages (instars), nymphs gradually change color from red to orange to black and develop wing pads as they develop. Populations tend to be clumped in an area of a lawn, and usually more than one chinch bug can be found in the bottom leaf sheath on a grass plant. As their host plants die, individuals will walk to neighboring St. Augustinegrass plants to continue feeding. Thus, dead patches of grass seem to get larger over time. The speed of turf’s death probably depends on chinch bug density and the turf’s overall health. Several methods can be used to find southern chinch bugs. The easiest and fastest is to part the grass near yellowed areas and look at the soil surface and thatch. Pull out individual grass plants and look inside the bottom leaf sheath. Examine several different areas if chinch bugs aren’t immediately found. Insects are most active on warm, sunny days in mid-afternoon.